1. Appy Couple (Free) - Appy Couple offers a little bit of everything. It provides a place for you to share photos of the happy day with others, arrange RSVPs, set up events, write stories about the day and arrange a gift registry too. You can use it to arrange a travel plan for your guests, before coordinating via the app’s messaging service, and ticking off a list of people who can attend. AirPlay means you can quickly project photos from guests onto a big screen during your special day, too. 2. WeddingHappy (Free) - WeddingHappy is an organizational tool focused on wedding planning. Simply tap in your anticipated wedding date, and the app builds a customized schedule of what you should expect to do and by when. A to-do list mixes in with suggested due dates, so you should always be able to keep on top of what needs doing. There’s a section for keeping track of vendors you require too, plus you can even find new ones via the app. 3. Wedding Checklist Guide (Free) - Wedding Checklist Guide is an older app so it won’t look as stylish as some others here. If you just want a straight forward but wedding focused To-Do list app though, it’s very useful. It offers a basic checklist of over 40 items, reminding you of what needs doing each step of the way. You can always add new ones too, as well as provide more detailed notes. 4. iWedPlanner (Free) - Aiming to cover all the bases, iWedPlanner likes to organize you. There’s a To-Do list function, a place to view details of hundreds of wedding suppliers in your area, a budget tracker, plus there’s an organizer for storing everything. A countdown feature reminds you of how long to go until the big day, too. 5. Tie The Knot (Free) - Everyone loves a fun countdown timer. Tie The Knot offers that for your iPhone, as well as your Apple Watch. You can add the time, your names, and a photo. The app counts down to the big day, then starts counting up since the day of your marriage. It’s cute and simple. 6. Zola Wedding Registry (Free) - There are plenty of options for wedding registries, but Zola’s a rather special one. It isn’t tied into one kind of gift. Instead, you can use it to add everything from a casserole dish to a special experience for the two of you. Guests can easily browse it in a kind of Tinder style interface, making it simple to order and pay through the app. It’s stylish and effective. 7. The Knot Wedding Planner (Free) - The Knot aims to inspire you when it comes to themes for your wedding. It offers a chance to view over 50,000 ideas from other real weddings, before allowing you to talk directly to vendors responsible for making them a reality. Alongside that are budgeting tools and a checklist for those trying to keep costs in check. 8. Wedding LookBook (Free) - Finding the perfect wedding dress is important, and also often tricky to do. Wedding LookBook makes it simple to browse many different designs, all from the comfort of your sofa. You can view gowns for brides, as well as bridesmaids, flower girls, and the mother of the bride. Engagement rings and wedding bands are also catered for here, making it easy to find the design for you. 9. 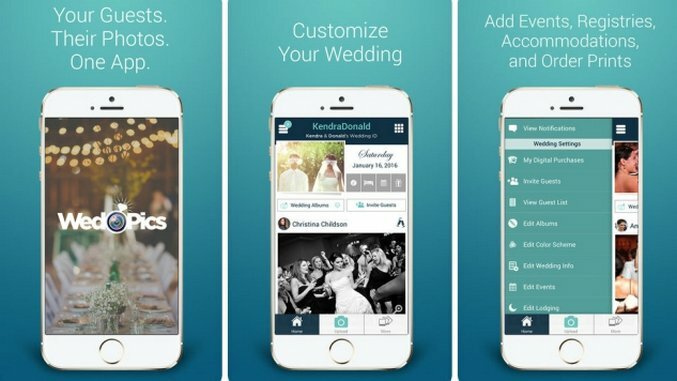 WedPics (Free) - Working as a wedding focused photo and video sharing tool, WedPics is an ideal app to get all the wedding guests involved in. It works as a form of website, offering details about lodgings, travel plans, and registries, but its greatest boon is giving you a place to share photos privately. It offers a web interface for those with conventional digital cameras too. 10. Wedding Countdown (Free) - Want a wedding countdown that’s extra romantic? Wedding Countdown offers the usual selection of timers and dates, but it goes further than that. You can add your favorite song to play in the background, as well as change the fonts and look around. Upgrade to the premium version, and you can add your own romantic/cheesy phrase too. You’ve reached that point in your life where you and your beloved have decided to get married. There was a cute proposal, you’ve told all your family and friends and now everyone’s pestering you about planning the wedding. While you could go for the expensive solution of hiring a wedding planner, a much more affordable option is to use a wedding planning app. Here are 10 entirely free solutions for helping your special day happen without a problem.